This framed black and white photo of the opening of the Canoncito Day School in 1935 hangs in the newly dedicated Luciano Platero Library. 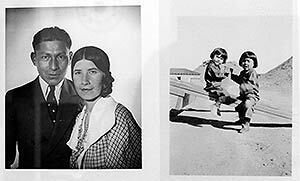 This framed 1930s photos of Luciano and Juanita Platero and their children, Tonita and Rosita, hangs in the newly dedicated Luciano Platero Library at the Tóhajiilee Community School. Few people leave a legacy behind that promises to last forever. Luciano Platero is one of them. On Aug. 12, the school library was named after him for his role in starting the first day school, almost 80 years since his untimely death in 1936 when he was just 27 years old. 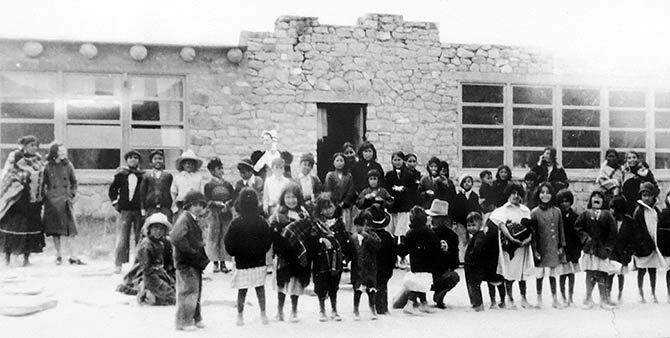 Opening the door of the Tóhajiilee community school library, framed black and white photos of Luciano and his wife Juanita, stand out on a painting of Deeshjin (Black Ridge Extending), a mountain that looms outside the window of the library. “From now on, everything we do with the library will have his name on it,” said Principal Karen Sanchez Griego.